Pelicans@Kings is raising funds during GSPCA Purple Week - Are you involved? In the heart of the Kings Premier Health Club, Pelicans@Kings offers great food, drink, snacks, coffee and more throughout the opening hours of the club. This week the team at Pelicans@Kings are supporting the GSPCA Purple Week celebrating 142 years helping animals in Guernsey. From their team wearing GSPCA logo'd tops to selling GSPCA merchandise and lucky dip bags the money raised will help the hundreds of animals at the Shelter in St Andrews. Come and join the Mad Hatter calling the bingo numbers this Wednesday for GSPCA Purple Week. 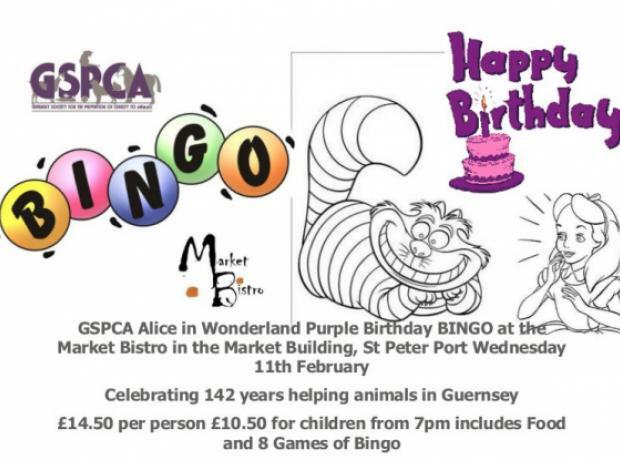 On Wednesday 11th February to celebrate our 142nd anniversary during GSPCA Purple Week we will be holding an Alice in Wonderland themed bingo night at the Market Bistro. Each of the Bingo nights are £14.50 per person or £10.50 for children. They start at 7pm and for the price it includes Food and 8 Games of Bingo. Fancy dress and bringing a musical instrument is optional, but encouraged. To Book your place or table please call 01481 257261 or online via our paypal link. After the success of the 5 bingo nights during 2014 the GSPCA are proud to present a full year of bingo nights. The first has an Australian theme as on Monday the 26th January as it is Australia Day and the second will be during GSPCA Purple Week with a birthday Alice in Wonderland theme to celebrate our 142nd anniversary. 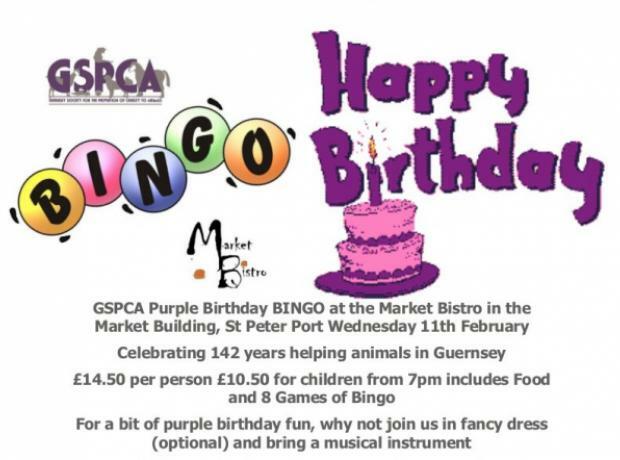 Steve Byrne GSPCA Manager said "We've had some great fun in 2014 with our bingo nights at the Market Bistro and Last Post. which has raised thousands of pounds helping the GSPCA and animals in Guernsey."